We are all celebrating local holidays, but are you introducing children to holidays around the world? Here is how we do it in our family. I was raised in a non-religious Jewish family that embraced the majority culture of the former Soviet Union. Luckily, my grandmother on my father’s side managed to foster my feeling of pride in being Jewish by talking often about famous people who share our heritage and about Jewish contributions to culture, science, and historical events. It’s important for me to foster a similar love in my daughter of pride and belonging to the three cultures of our family – Jewish, Russian, and German. This is why we celebrate heritage holidays from our own countries and cultures of origin. September is the month of Jewish High Holidays Rosh Hashanah and Yom Kippur, and today is Rosh Hashanah holiday. We don’t celebrate Jewish holidays the “real” way, but we read books and talk through the history of these holidays. We are not a religious family, but Smarty certainly heard the Biblical creation version of how the world came about, and she enjoys the idea of having a holiday to celebrate the day when God created Adam and Eve. We also follow the tradition of eating honey and apples on Rosh Hashanah in hopes of a sweet year for all of us. While embracing our own heritage is “priority one” for me, I also want my daughter to know about other holidays around the world. There are plenty of them in September, such as Indian Janmashtami (Krishna’s birthday) or Islamic Eid al-Adha. September 15 also marks the beginning of Hispanic Heritage Month in the United States that starts with celebration of Mexico Independence on September 16. You can find major diversity holidays here and pick one or two every month to celebrate with your kids. You don’t need to celebrate them in the same way they are celebrated in countries or cultures of origin. We usually read books about the holidays or the countries of their origin, make a dish from that country and, sometimes, have an art or a craft project. Here is an example of how we celebrated Chinese Harvest Moon holiday a few years back. Do you celebrate any multicultural holidays in your family? Which ones? 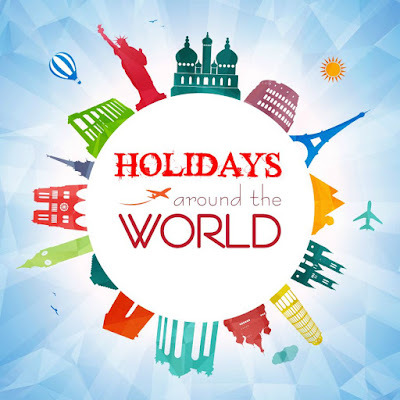 Follow my Holidays Around the World Pinterest board. My oldest is taking a world religions class, right now - it might be fun to set up a few celebrations for the younger sibs and see what he can add to their insight. We don't, but I would like to eventually. I find that we barely celebrate most of the ones that are from our own culture at this point. I could see doing more as my kids get older. Our background is pretty mainstream. I like the idea of learning about others. Id's like to check out your book pick and eat apples with honey today. Happy New Year Natalie! I'm kind of like Maryanne, we're doing good to celebrate holidays from our own culture. I always have grand plans, but then life happens and I don't follow through.